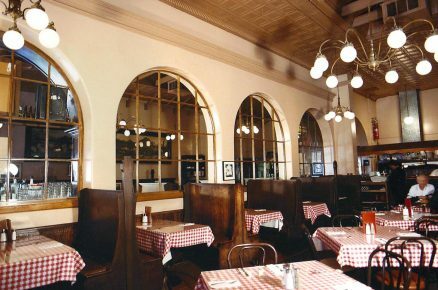 Joe's Restaurant - Lawrence Thompson Architects, INC.
"Invigorating a great city dining tradition"
Two remodels at Cota and State Streets, Santa Barbara., including vintage interior reconstruction with tin ceilings, old bar cabs, new archways, the last remodel for a seismic rehabilitation. This restaurant is a landmark in town, yet required seismic work. The old bar was lengthened in matching woodwork, while added arches were provided to extend a dining room adjoining. Existing tin ceilings were preserved and required structural brackets, proportioned to coordinate with the ceiling and wall décor.